Really, has there ever been a play funnier than Oscar Wilde’s The Importance of Being Earnest? No matter how you experience it – by reading the play, seeing it performed live, or watching one of the film adaptations – you’re sure to be splitting your sides with laughter in no time. Even if you’ve seen the play or one of the films before, you’ll laugh just as hard – maybe even harder – than you did the first time you saw it. Knowing all the uproariously funny jokes to come, all the farcical plot twists and turns Wilde has up his sleeve just adds to the fun. Who is your favorite character in the play? Like many viewers, I am partial to Lady Bracknell, the forerunner to Violet, the Dowager Countess of Grantham, played so consummately by Maggie Smith on Downton Abbey. Lady Bracknell’s arch observations – complete with eyebrows lifted and eyes peering down her aristocratic nose – are droll and on point every single time. “To lose one parent, Mr. Worthing, may be regarded as a misfortune,” she says near the beginning of the play. “To lose both looks like carelessness.” The scene from which this line comes – in which Lady Bracknell interrogates Ernest (or is it Jack?) Worthing as he seeks her daughter Gwendolyn’s hand in marriage – is one of the funniest in the play. But the rest of the play is supremely satisfying comedy as well as we learn the importance of being Ernest. Like Lady Bracknell, Oscar Wilde himself was a force to be reckoned with. No upholder of the aristocracy, Wilde instead flouted convention at every turn. One source says, “Known for his biting wit, flamboyant dress, and glittering conversation, Wilde became one of the best-known personalities of his day.” He reigned supreme as the British playwright of the 1890s. Wilde’s lover was Lord Alfred “Bosie” Douglas, whose father, the Marquess of Queensberry, had planned to throw rotten vegetables at Wilde after the debut in early 1895 of The Importance of Being Earnest. Wilde and Bosie pre-empted the plan, and Wilde prosecuted the Marquess for criminal libel. Eventually, Wilde dropped the charges against the Marquess but was then himself arrested and tried for gross indecency with men. Ultimately, Wilde was convicted and received the maximum penalty for crimes of homosexuality: he was imprisoned for two years’ hard labor. In 2017 – more than 120 years after his conviction – Wilde was pardoned for his offense. When Britain passed the Policing and Crime Act of 2017, homosexuality was no longer a crime in the United Kingdom, and an estimated 50,000 men, including Wilde, were pardoned. Unfortunately, the trial and imprisonment exacted a great toll upon Wilde. The Importance of Being Earnest was his last play, and he never fully recovered – creatively or otherwise – from his trial and imprisonment. Five years after The Importance of Being Earnest premiered in London and three years after being released from prison, Wilde died penniless in Paris at the age of 46. A great literary light was extinguished. 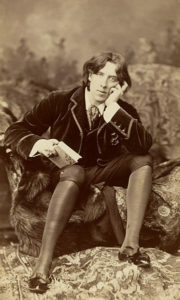 To learn more about the inimitable Wilde, visit the Oscar Wilde Website or the website of the Oscar Wilde Society. Richard Ellmann’s 1987 volume, Oscar Wilde , is the definitive biography. It was used as the basis for the outstanding 1997 film Wilde , with Stephen Fry playing Wilde and Jude Law playing Bosie. Ready to revisit this wonderful play – or to discover it for the first time? You can read the play online at Project Gutenberg or buy a hard copy of the play . Two film adaptations – Anthony Asquith’s 1952 film or Oliver Parker’s 2002 version (starring Colin Firth and Judi Densch as Lady Bracknell) – bring the play to life in all its comedic glory. Later on I think everyone will recognise his achievements; his plays and essays will endure. Of course you may think with others that his personality and conversation were far more wonderful than anything he wrote, so that his written works give only a pale reflection of his power. Perhaps that is so, and of course it will be impossible to reproduce what is gone forever. Watch:Watch Michael Redgrave (as Ernest/Jack Worthing) and Edith Evans (as Lady Bracknell) in the classic suitor interrogation scene from the 1952 film adaptation of The Importance of Being Earnest. Comedy doesn’t get any better than this! Image Credit: Oscar Wilde in 1882, public domain, https://commons.wikimedia.org/wiki/File:Oscar_Wilde_Sarony.jpg. Enjoyed reading about and seeing clips of EARNEST, Linda. My son-in-law, Michael Aulick, theater professor at West Liberty University, directed the play a couple of years ago. Sure love my StoryWeb tee shirt.